Okay, it’s eBoy influenced, but it’s also got the Flatiron building and the Empire State, and the restaurant from Seinfeld. I really wanted to have a go at putting as much proper New York architecture into here, while also sticking with the reusable assets workflow I’d been trying to perfect. It’s worked – this one took me about 60 hours over two months, which is an improvement, plus practically all the architecture was drawn from scratch for this project, and about 3/4 of the characters. I also used this project as an opportunity to experiment with a few new techniques. The assets for the architecture were all drawn using the fantastic ISOPix Pro app on Android, and were all in greyscale, giving me freedom to use colour and contrast options in PhotoShop to palette-swap certain repeat elements. 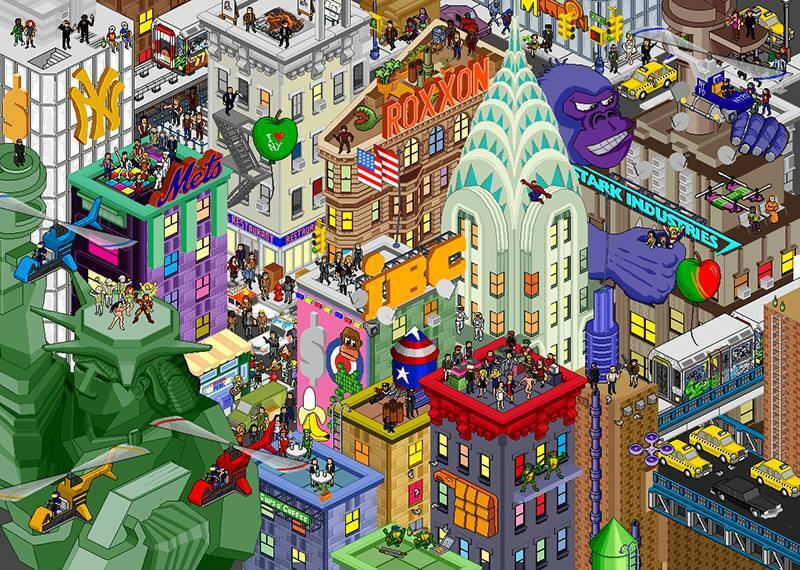 I was interested in the New York pop-culture references here, as well as the buildings. I never managed to fit in the brownstone that I drew, though, which is a shame, nor 40 Rockefeller plaza, though some pieces survive with the 40 Rock cast on the roof with the IBC logo. The whole poster came about because of a conversation with an agent who liked my London poster but wanted to see more real world cities. I toyed with Sydney, but NY had more references to draw on, though I’ll have to go back and remove Adam Jensen – I completely for got that he’s from Detroit (I had Deus Ex on the brain because of including JC Denton). I also thought originally that the Nakatomi Plaza from Die Hard was in New York, but at least I was able to keep John McClane. Anyway, enjoy looking for film, TV and other references.